Learn more about the characteristics of pave & micro-pave setting. Diamond settings are the platform, or stage on which the diamond is displayed. Don't undermine the importance of the right setting. This is how you are going to show off your diamond to the world, so think about how you want the diamond to be seen as well as it fitting comfortably on your hand. A 4-prong setting is one of the most popular and widely used settings on the market today. 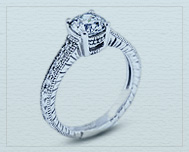 However, a setting with diamonds adds additional sparkle or color. We hope the guidance below to help you in making a decision with the setting of your ring. 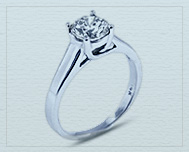 The prong setting is the most popular setting used for engagement rings and other jewelry. 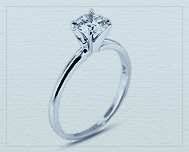 This setting puts the emphasis on the diamond and not the metal. The prongs are placed at the key points of the stone, typically at four corners or at four, six, or eight points evenly spaced around the stone, to offer security without interfering with the stone's brilliance. These prongs raise the diamond up off of the finger and into the air, allowing the maximum amount of light to reach the diamond. Allowing light to shine up through the pavilion of the diamond (the bottom portion of the diamond) through the diamond and out the table of the diamond (the top flat portion) will allow the diamond the maximum amount of sparkle and brilliance. This setting has four or six metal prongs holding the diamond securely in place while allowing light to shine up through the diamond to maximize sparkle. Classic setting is very clean and simple style what keeps it in number one popularity worldwide. Trellis The Cross Wire Trellis Setting has basket with metal crossing the center diamond, drawing the eye toward the diamond. The Trellis rings give a unique deigns when looking from the side of the ring. 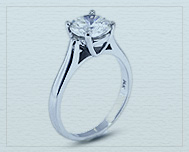 The Cathedral Setting has metal arching up toward the center diamond, drawing the eye toward the diamond. Cathedral rings have projections on each side of the stone and these design elements are what gives this ring its name. They are inspired by the arches that supported the walls of early cathedrals. The basket setting is essentially a miniature metal basket which has been customized to the stone. Two small rings at the bottom of the setting which run parallel with the top facet are used to stabilize the stone and provide support for four to six prongs which curve over the top of the stone, holding it firmly in the setting.